The name Mthimkhulu means “Big Tree” in isiZulu, and is the family name of the Kunenes. The image of a tree providing shelter and protection to those in need, is a powerful symbol of the work the Kunenes carry out. In the heart of Soweto township, South Africa, Mthimkhulu Stimulation Centre provides hope, health and love to disabled children and their families. 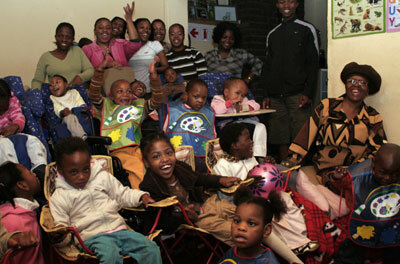 Founded in 1999, this Centre for Disabled Children is one of its kind in the area. Around 25 children are cared for at the centre every week day, freeing up their families to pursue full time employment. The children are given a caring, stimulating environment, where they can learn to overcome their disabilities.